On a sultry morning I threaded my way from Liverpool Street, through the narrow alleys around Spitalfields market to the wonderful Raven Row gallery. Alex Sainsbury has established a widely admired programme here that regularly includes museum quality examinations of important but neglected 20th century artists and movements, as well as unexpected delights like his exhibition of Seth Siegelaub’s textile collection in 2012. 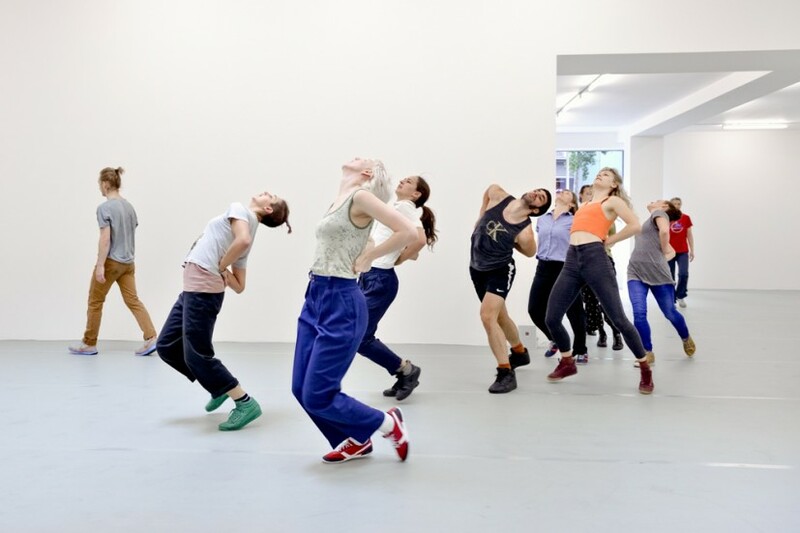 The current show transforms the crisply converted ground floor gallery into a performance space, host to a group of dancers specially trained by Yvonne Rainer and her long-time collaborator Pat Catterson. All the other spaces in the building are showing archival materials relating to the early part of Rainer’s career, devoted to dance and before she turned her attention exclusively to film in the late 70s. Raven Row’s immaculate production values make this an engaging display, but the main event here is the opportunity to see live versions of some of Rainer’s most celebrated dance works. Four times a day the group begin with the silent ensemble work Trio A (1966), followed by Diagonal (1963), then the very rarely seen Talking Solo (1963) and finally Chair Pillow (1969). These last two works have never before been performed in the UK. Rainer made her name in the early 60s with her radical and controversial approach to dance. At the Judson Dance Theatre she associated closely with rising art world stars Robert Rauschenberg and Robert Morris and was steeped in the aesthetic discourses of the day. 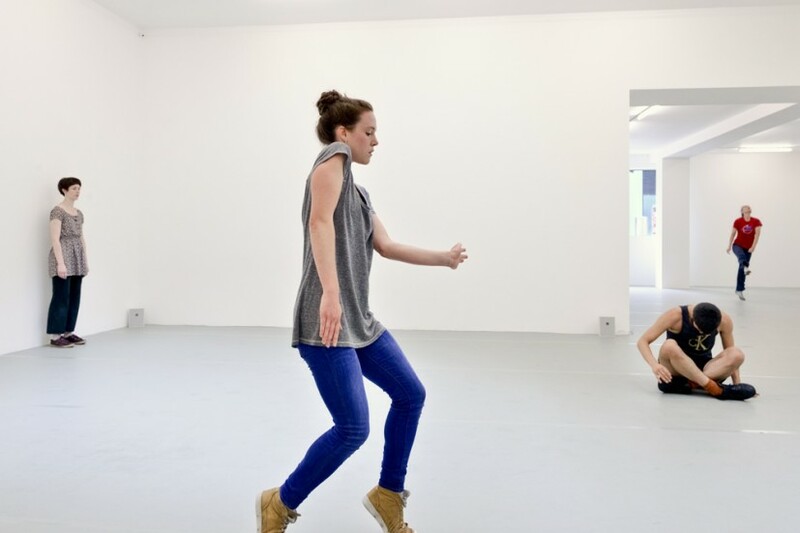 Her choreography excised narrative, producing a style of movement that is ungendered, devoid of affect and characterised by repetitive motifs and a studied lack of any flourish in each formulated set of gestures. There is an insistence upon the ordinary, the everyday and the utilitarian in the choreography. Even when five or six of the dancers traverse the diagonal of the space executing a simultaneous grand jeté there is no “ta-da!”. But lest you think this all too dry an experience, the whole is leavened with a judicious dose of slapstick, courtesy of an affection for another great American performer, Buster Keaton. At regular intervals for example, subgroups of dancers coalesce in Diagonal and perform a stiff-legged, tip-toe strut across the space, with their cheeks blown out as if blowing up balloons. It even makes the dancers giggle. 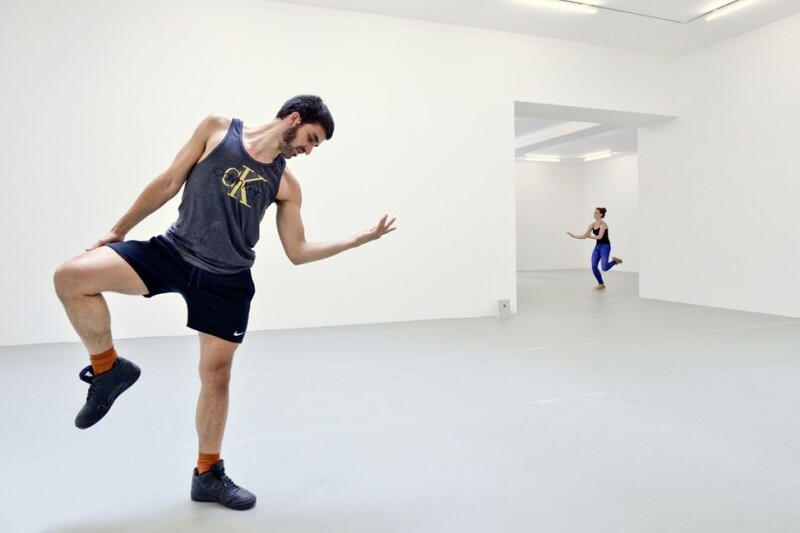 After eight years studying with Merce Cunningham, Rainer was also influenced by John Cage’s theories of chance. In one of the upstairs galleries is a film work Rainer made in 1968 called Rhode Island Red. I went to see it before the performance began and it consists simply of a fixed camera shot of a chicken coop, with the eponymous birds pecking and scratching and moving among each other. Unlike the first film she made, Hand Movie (1966), in which a disembodied hand goes through a careful and intricate sequence of tiny movements of each digit, Rhode Island Red seemed to make little sense until I saw Trio A. In this performance groups of dancers regularly accumulate in huddles in the corners of the space, and subgroups reconfigure again and again on the speaking of a number or letter that denotes a sequence of movements. Trio A and Diagonal are performed in silence, and when I was there an open window to the street brought in the lunchtime noises of passers-by, sirens and the distant clatter of building work in a way that seemed wholly appropriate to the spirit of the work. The final work performed, Chair Pillow is done to an accompaniment of Tina Turner’s River Deep Mountain High – a rousing, emotional anthem in dramatic counterpoint to the studied dead-pan of the dancers as they briskly work with their props. It is tremendous, uplifting, joyous. This is a rare and precious opportunity to see great, little known work, quite brilliantly produced. Whether the sun shines or the rain falls this weekend, there’s no excuse to miss this. The next Friday Dispatch will be published Friday 5 September.